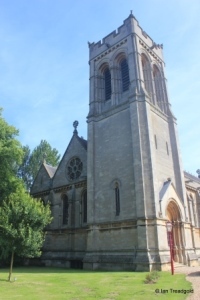 The church of St Mary in Woburn is situated to the west of the village, on Park Street which leads towards Woburn Abbey. 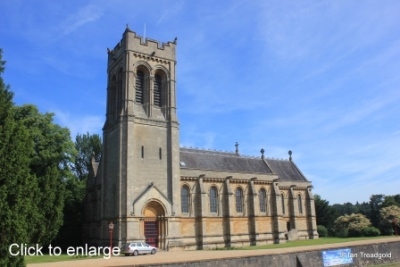 Limited parking is available outside the church and plenty of space is available in the village car park opposite the church. 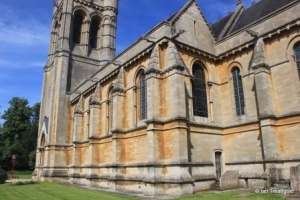 The church consists of a nave and chancel, north and south aisles, south-west tower and vestry. 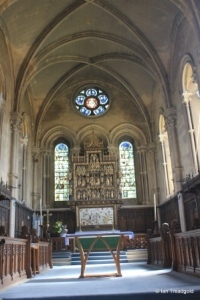 The chancel is around 50 feet by 26 feet with the nave adding around 84 feet. The aisles are some 16 feet wide and the tower is around 20 feet square and around 70 feet high. 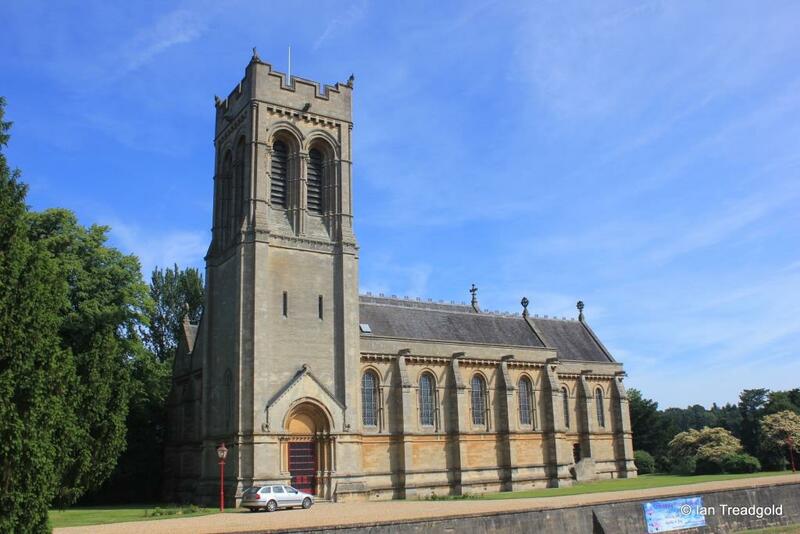 The present church of St Mary (new St Mary) dates from 1868 and was built at the request of the 8th Duke of Bedford. 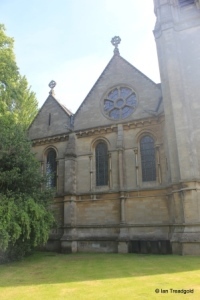 Originally the plan was to replace the church in Bedford Street, the main thoroughfare in Woburn. That church (old St Mary) was duly demolished in 1864 leaving just the tower. It was then discovered that the site was unsuitable for the planned building and a new site had to be found. 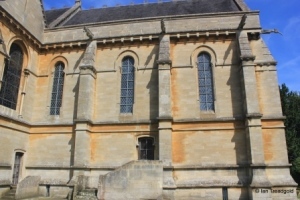 A church on the old site was rebuilt in a smaller scale to serve as a mortuary chapel along with the original tower which gained an ornate upper storey. 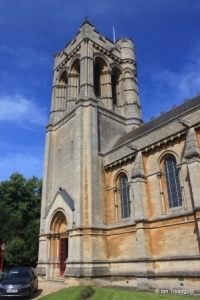 The old St Mary now serves as the Woburn Heritage Centre. The site chosen for the new St Mary was in Park Street and at the time was a pond which helps explain some of the topography of the church. The land on which the church is built is separated from the road by a revetment, ditch and bank. To the north the land falls away steeply giving access to the crypt under the building. 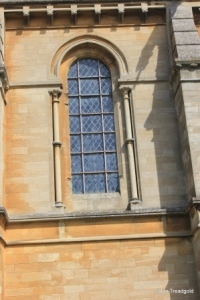 The south side of the chancel has three single lancet windows rising above the doorway giving an indication of the loftiness of the building. 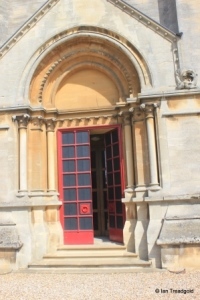 The doorway into the chancel on the south is accessible via a short flight of stairs giving an indication of the change in levels between the outside and inside of the building. 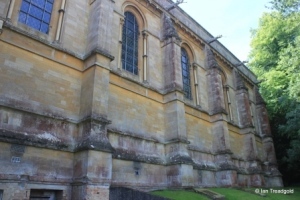 The south aisle of the church has windows to the east and four to the south with the aisle terminating in the south-west tower. 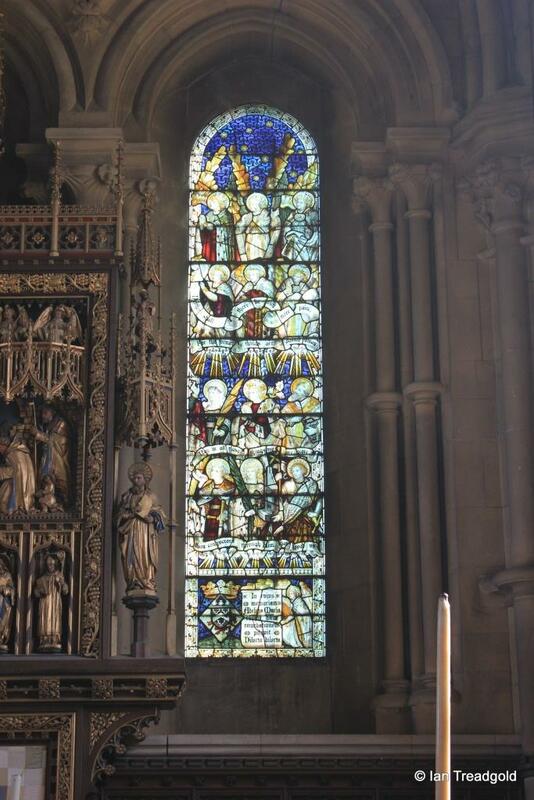 The east window of the aisle, like all the windows in the church has a plain rounded arch with intricate colonettes decorating the arch. 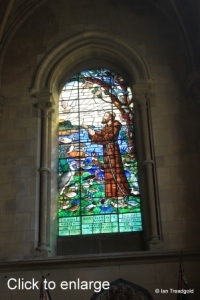 The glass in the window shows St Francis of Assisi and was placed in memory of the ‘Flying Duchess’, Mary, Duchess of Bedford 1865-1937. 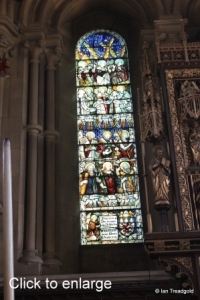 The four windows along the south side of the aisle are identical. 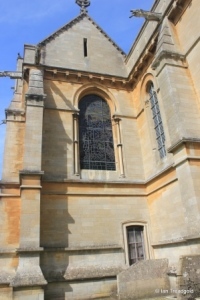 The south-west tower incorporates the south doorway. When originally built, the tower incorporated a tall pyramid spire almost as tall again as the tower. 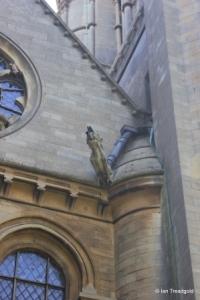 In 1890, just 22 years after the completion of the church it was found to be in a dangerous condition and had to be removed in the following couple of years. 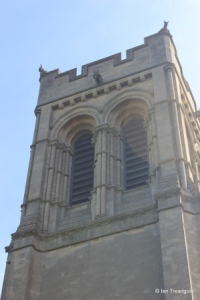 The belfry openings are ornate with extensive use of colonettes in a similar style to the other windows in the church. 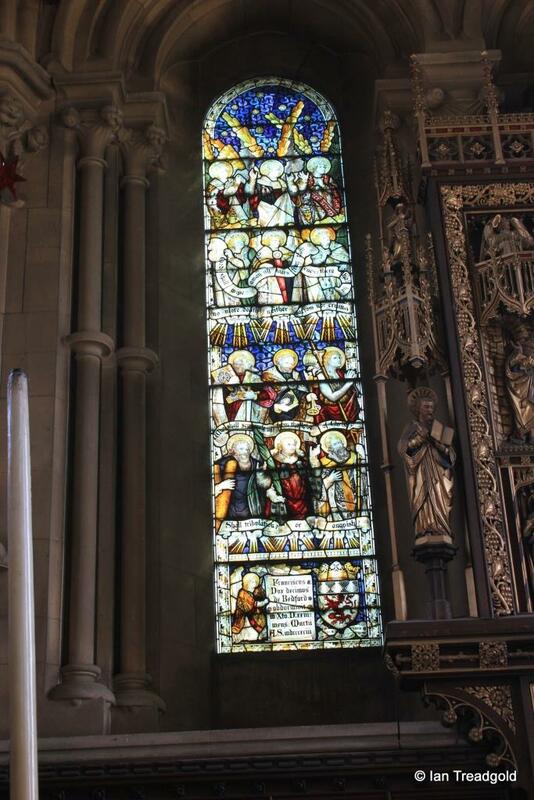 The west end of the nave has two separate windows of the usual style with a round window above in the gable. 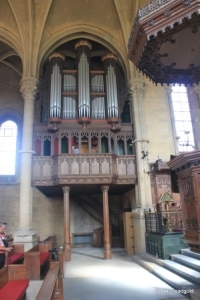 There is an internal stair to the tower in the angle between the west end of the nave and the tower which stands slightly further westwards than the end of the nave and north aisle. 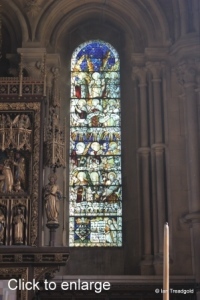 The west end of the north aisle has a single window. 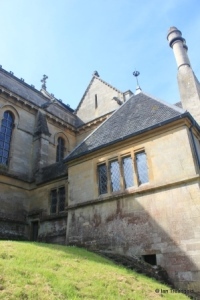 Towards the north side of the church, the ground drops away considerably allowing for the crypt under the building. 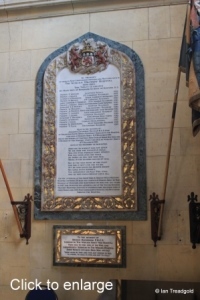 Originally built to house a mausoleum to the Dukes of Bedford it was never used for that purpose with the family continuing to use the family estate at Chenies in Buckinghamshire. The crypt is now used for weddings and other events. 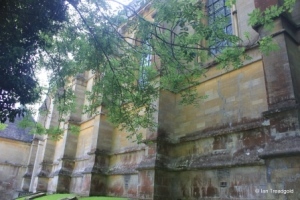 There is a large vestry adjoining the north aisle and chancel with the difference in ground level being increasingly apparent on the north side. 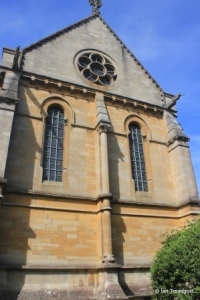 The east end of the church is similar to the west with two separate east windows with a round window above. 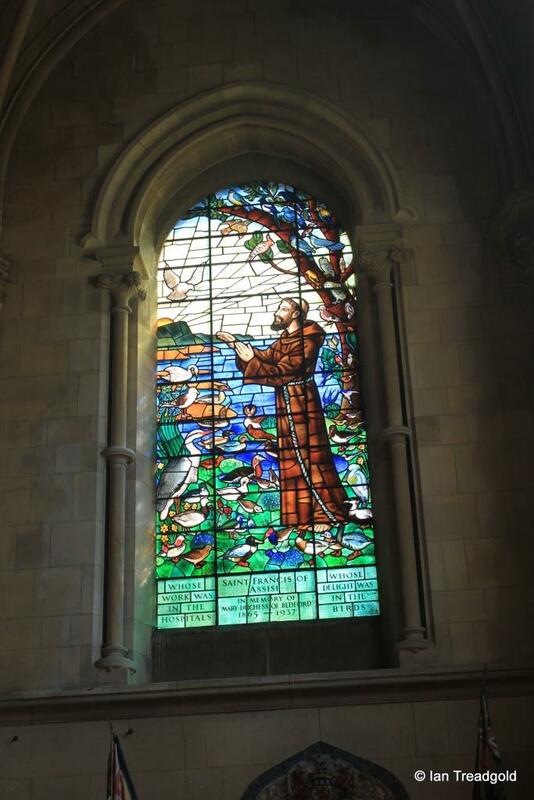 The glass in these windows dates from 1894 and commemorates Francis, 10th Duke of Bedford. 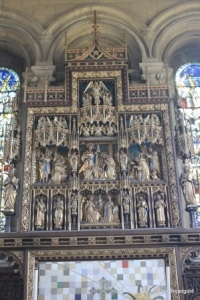 The windows surround the very ornate reredos designed in 1903 by CE Kempe although there is some evidence that it was designed by WD Caroe. 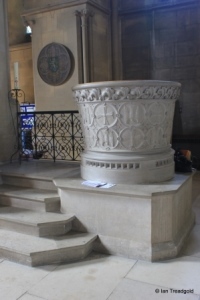 The large font is situated at the west end of the nave and accessed via four steps. 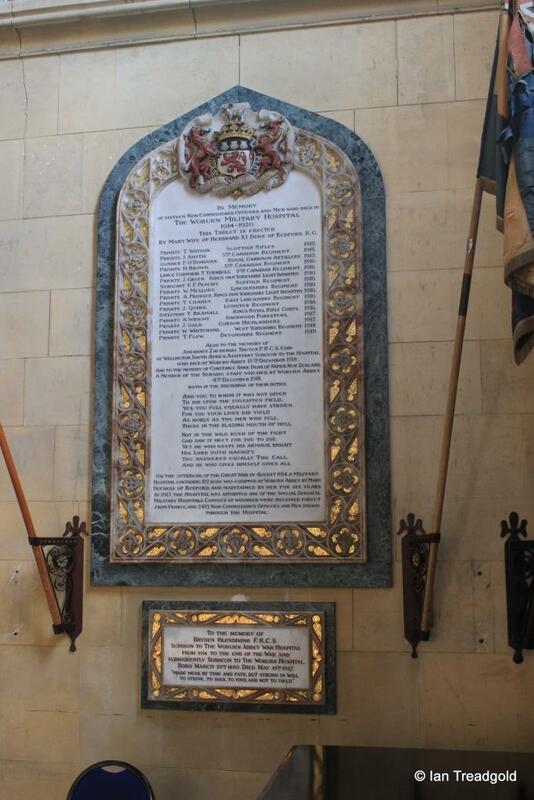 Under the window at the east end of the south aisle is a memorial to those that died in the Woburn Military Hospital during and after the First World War. 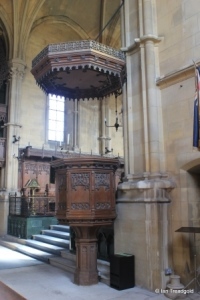 The ornate pulpit and tester date from 1902 and the organ from 1904.